Nobody knew quite what to expect from DraftKings’ first foray into the uncharted territory that is a live final for sports betting. The format had never been attempted before, and now they were trotting it right out with $2.5 million in guaranteed prizes (including, as it turned out, $1.2 million in overlay) and 260 competitors. The first World Series of Poker Main Event with a tournament format welcomed a field of six players and a winner-take-all prize of $30,000 and took decades to evolve into an event with a seven-figure first-place payout. But mere months into what looks to be the start of an American sports betting boom and eager to make a splash, DraftKings fast-forwarded past all the small-field stuff and took a shot despite the likelihood of needing some trial and error to get a competition like this right. 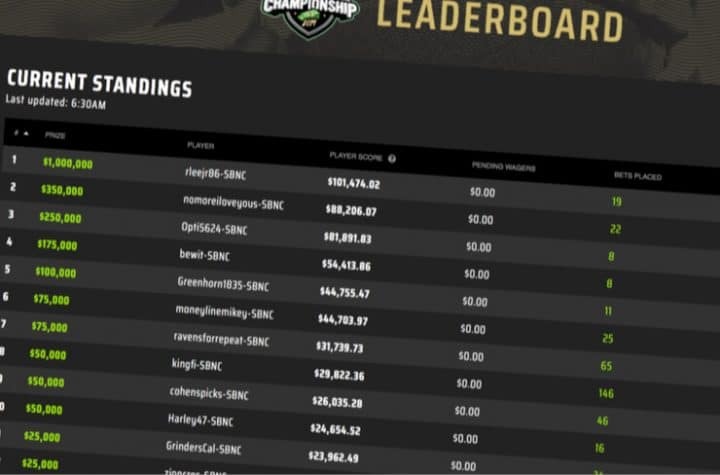 Now that the first DraftKings Sports Betting National Championship is in the books, we can confirm: This trial definitely came with some error. It also generated a lot of excitement and interest and left many players impressed and promising to come back next time. With that “next time” in mind, here are five lessons we — meaning everyone from organizers, to players, to journalists — learned from this experimental first shot that played out this past weekend. Let’s get straight to the controversy. Randy Lee, a 32-year-old poker dealer from New Jersey betting under the screen name “rleejr86,” won the competition with a final bankroll of $101,474.02. He bet $47,500 of the roughly $58,000 left in his bankroll on the Eagles to cover the 8.5-point spread in the final NFL game on Sunday and hit to become the only entrant to cross the $100K threshold. Lee won the million-dollar first place prize, plus the $101K in his ’roll, plus a $50K bonus for entering Sunday with the lead. Daniel Steinberg, playing under the screen name “nomoreiloveyous,” also hit on the Eagles to surge into second place with a little over $88K. My Pats bet didn't grade before the Saints game started, so I couldn't get anything down. This is some sh*t.
Of course, being locked out can go both ways. RotoGrinders CEO Cal Spears had a similar situation and said he intended to bet his whole bankroll on a parlay involving the over that would have lost. By being unable to get that bet in, Spears landed in 11th place for $25K plus his ‘roll of almost $24K, rather than finishing with zeroes across the board. It’s like when people complain about the last seat in blackjack “taking the dealer’s bust card”; for every time that happens, there’s a time when the last seat takes a card that would have helped the dealer. DraftKings tried to keep things simple on Sunday by only allowing betting on the two NFL games and by not allowing in-game betting on the second game, but that wasn’t simple enough, apparently. Organizers could have foreseen a close shave between the end of one game and the start of the other. And they should have made certain that, considering all bets were made digitally, the payouts hit accounts automatically when the Pats-Chargers game clock read 0:00. Somehow that didn’t happen. It is a little weird to pay out the Sony Michel yardage prop early. What if he crosses 61.5 yards … then has a couple of 10-yard rushing losses in a row? Spears is right: All bets on a game have to pay out, to everyone, at exactly the same time. We probably could have guessed this going in, but it’s how you finish, not how you start. Plenty of entrants, including notoriously fashionably late Phil Hellmuth (okay, the use of “fashionably” there might have been a reach), didn’t place a single bet on Friday. As is the case in poker, you can lose a tournament on the first day (10 DK SBNC competitors went bust on Friday), but you can’t win it on the first day. The leader after Day 1 was “johnstorz” with $30,877.75. He finished out of the money. Of the top 10 entering Saturday morning, three ended up in the top 25. It doesn’t hurt to do well on Day 1, obviously. But it’s more important to just be in the hunt and then hit your big bets on Sunday. Oh, and if you want to win this sports betting competition next year, you’d better know football. Soccer and basketball bets on Friday and Saturday can help you build a bankroll, but the format ultimately favors those who know how to bet on the NFL because that’s all you’re allowed to do on the final day. Over the course of three days, “hillsidesports” made 577 bets! He (or she) finished out of the money with about $2,500. Other contestants made 267 bets, 214 bets, 186 bets, and so on, with no leaderboard money to show for it (until you got down to No. 7 on the “most bets placed” list). Meanwhile, the top five on the final leaderboard made 19, 22, 8, 8, and 11 bets, respectively. The lots-of-little-bets strategy appears, based on a sample size of one sports betting competition, hard to win with. The more successful strategy, it seems, is to make a modest number of bets, increasing in size as the competition goes along and your bankroll increases, with parlays mostly limited to realistic two-leggers. Needless to say, you have to pick a lot more winners than losers, which requires both skill and luck. As with a poker tournament or a daily fantasy GPP, it’s not always skill that prevails. In this particular sports betting event, if someone had just a few thousand dollars left entering the final game but happened to take a long shot on Philly’s fourth receiver Jordan Matthews to score the game’s first TD, that luckbox would be a million dollars richer today. In the end, though, it seems the best strategy other than “be a luckbox” is to not take too many crazy risks and limit your variance by making just a handful of bets per day. There was much discussion beforehand about what the winning bankroll figure would be, with guesses ranging from about $50K all the way to $250K. Of course, the bigger the field, the higher the final score is likely to be, so if this thing hits 500 players in 2020, don’t expect $100K to win it. As SharpSide’s Donnie Peters reported, through the first two days of action, the betting handle for the event was just over $3 mm. So with the field thinning but the bet sizes increasing on Sunday, DK likely processed between $4-5 mm worth of bets over the course of the whole contest. DraftKings is already the leader in New Jersey online sports betting handle (and a new report coming out later today is unlikely to change that), but DK figures to win January by a bigger margin than ever. However, what’s good for the handle isn’t necessarily good for the revenue, especially if you’re reporting the overlay. The SBNC drew 260 entrants, well short of the 500 needed to avoid overlay (and the 531 needed to increase the leaderboard prize pool). DraftKings ultimately ended up having to add $1.2 mm to the pot, since only $5,000 of every $10,000 entry fee went into that pool. The other half of every player’s entry fee went into his or her bankroll, meaning there was $1.3 mm in play among the 260 contestants. Exactly half the field, 130, ended up with $0 in their accounts. We crunched the numbers, and the other 130 players ended up with a grand total of $965,753.57 in take-home cash in their bankrolls. That means DraftKings kept $334,246.43 thru vig and losing bets. All in all, it was a revenue loser for DK, to the tune of about $865,000. And it might get worse if the company chooses to or is forced to make good with players like Peabody. But there’s certainly value for DraftKings in the publicity and buzz the event generated. And much of that $965,753.57 won’t be withdrawn — it will stay in play and end up in DraftKings’ coffers eventually.